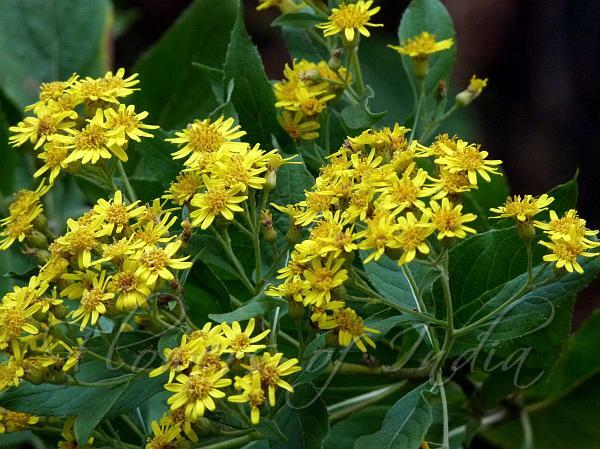 Lanceleaf Inula is a shrub which grows on the slopes of deep, wet valleys in the Himalayas. Stems are 45-100 cm high, young branches velvet-hairy. Leaves are elliptic, ovate-lanceshaped, pointed or shortly tapering, rough on the upper surface, thinly velvet-hairy outer lower surface, stalked with up to 1.5 cm long leaf-stalk. Flower-heads are borne in branch-end corymbs, 0.7-1 cm in diameter, stalked. Flower-cluster-stalk are 6 cm long, slender. Ray florets are strap-shaped, up to 1 cm long; ligule up to 4 mm, abruptly narrowed; 3-lobed, 5-ribbed; ribs prominent. Disc florets are up to 9 mm long, 5-lobed; lobes recurved. Involucral bracts are in 2-3 whorls; the outer linear-oblong, 2-3 mm long, hairy on upper surface, midrib prominent; the inner pale, linear, pointed or shortly tapering, 5-6 mm long, appressed hairy. Achenes are dirty white, 2 ridged up to 2 mm, silky hairy. Pappus up to 5 mm long; hairs fringed or feathery at tip. 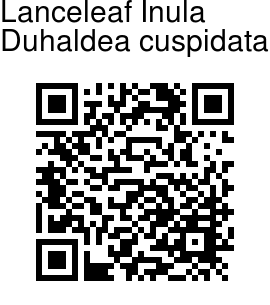 Lanceleaf Inula is found in the Himalayas, at alitudes of 300-2100 m, from Kashmir, Himachal Pradesh, Uttarakhand to NE India and China. Flowering: June-October. Medicinal uses: Traditionally, the plant is used for the treatment of dyspepsia and colic. Studies on the essential oil obtained from the leaves showed antifungal activity. The leaf extract of the plant showed anti-inflammatory, and significant antibacterial and antifungal activities. Identification credit: Gajendra Rawat Photographed in Mussoorie, Uttarakhand.